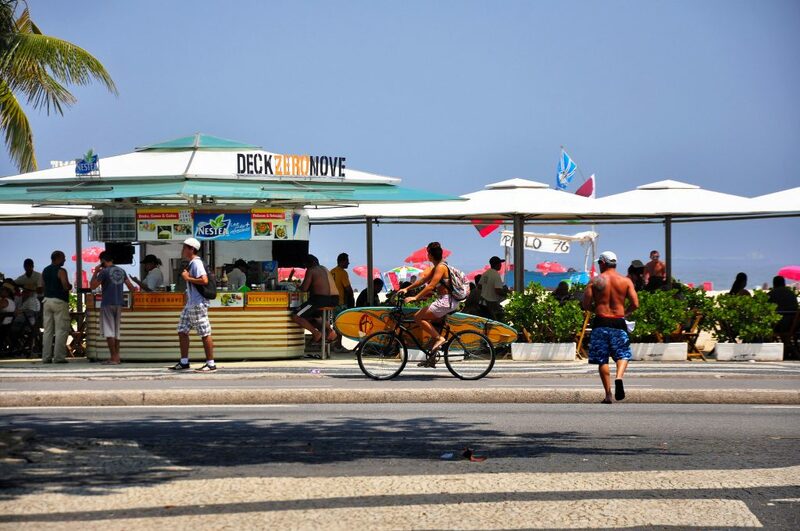 From hosting live music, to offering sophisticated cuisine, to simply serving an ice-cold beer or ‘água de coco’ (fresh coconut water), kiosks are a staple of Carioca beach life. RIO DE JANEIRO, BRAZIL – Somewhere between the restaurants and bars on the streets and the food and drink-sellers on the sand lie the ‘quiosques’ (kiosks). These informal bars and restaurants often serve excellent cocktails, something delicious to eat, and even put on live music and broadcast the latest football (soccer) game. Here are a few of the best kiosks in Rio de Janeiro. 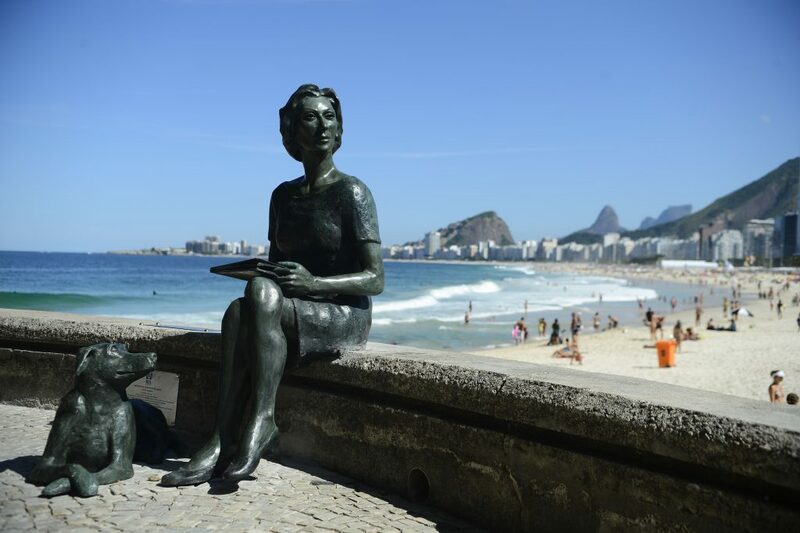 Next to the statue of famous Brazilian writer Clarice Lispector, the kiosks of Leme offer some of the best places to watch the sunset in Rio de Janeiro, photo internet reproduction. He adds, “it also offers a true culinary experience based on a Mediterranean menu and great wines.” Located on the picturesque ‘Caminhos dos Pescadores’ (Fishermen’s Way), which offers some of the best beachside views in the city, are Espetto Carioca – a kiosk famous for its ‘espettos’ (barbecued sticks of meat or cheese) and its less pricey but equally charming neighbor, Pedra do Leme. Australian DJ Billy Aldea-Martinez, or ‘WilHvlm,’ recommends the kiosks along the beach that often play electronic music and host chilled-out daytime parties. “There are a few great kiosks that put on these daytime parties. Juanna is a new one that recently opened around Posto 4 in Copacabana.” He adds. “However, my favorite would probably be Abracadabra near Posto 2 on Copacabana beach, where they play electronic music some Saturdays and Sundays.” He says. For those that aren’t familiar with the ‘Postos’ (numbered lifeguard towers distanced around a kilometer apart, which offer toilets, changing rooms and showers for around R$2.00) here is a helpful guide. Also located near Posto 4 on Copacabana beach is the Praia Skol quiosque, which often hosts some of the best live music among the kiosks. While plenty of kiosks often feature samba singers and more traditional music, Praia Skol also regularly puts on pop and rock bands, with plenty of bands playing international hits from the US and England. Both during the day and after dark, Praia Skol kiosk can draw a sizeable crowd (depending on the live music) that makes it more reminiscent of a concert venue than a beachside hangout. Kiosks play a central role in the beach-going rituals of many Cariocas, offering a place to step away from the beach and replenish their hunger and thirst without having to venture onto the streets, photo courtesy of Alexandre Macieira/Riotur. There are also plenty of kiosks to be found beyond Copacabana, with many of them offering something a little more upmarket. “Nothing beats the unique casual atmosphere of drinks directly on the beach at one of the sophisticated kiosks in Ipanema, São Conrado, or Barra.” comments Anna Whyte, Australian-American NGO volunteer and longstanding Rio resident. She picks Azul in Ipanema, Gávea Beach Club in São Conrado, and Clássico Beach Club in Barra da Tijuca as among her favorites. Other excellent choices along Ipanema beach include the Pão de Queijo kiosk next to Posto 9, which offers the delicious Brazilian snack of ‘cheesebread’ among other ‘salgados’ (savory snacks); and the Itaipava kiosk in between posto 9 and 10, which is great for caiprinhas and beers.